Elektropohony - VYBO Electric a.s.
Kompletné riešenia pre elektro pohony. ABOUT STANDARD E550 series inverters are low power universal inverters developed based on new hardware platform, which are characterized by extraordinary performance, complete protection function, small structure, elegance and durability. Optional control keyboard can be flexibly used by users according to requirements, and the inverter is especially configured with a status indicator, which can allow for easily monitoring the keyboard-free operation and basic operation status. – VVVF space voltage vector algorithm. – Highly adaptive to grid voltage, and can stand for ±20% fluctuation. – Special self-adaption control technology, able to automatically limit current and voltage and conduct undervoltage inhibition during operation. – Particular self-adaptive control technology, allowing for automatic current and voltage limitation and undervoltage suppression during operation. – Output frequency up to 1000Hz, able to be applied in various variable frequency speed adjusting occasions of high-speed motors such as grinding machines, engraving machines and centrifugal machines. – Configuration of RS485 communication interface, optional MODBUS protocol and VYBO self-defined protocol; with linkage synchronous control function, allowing for easily communicating inverters with PLC, industrial personal computers and other industrial personal equipments. – The panel supports hog plug, applicable for system integration for various applications. 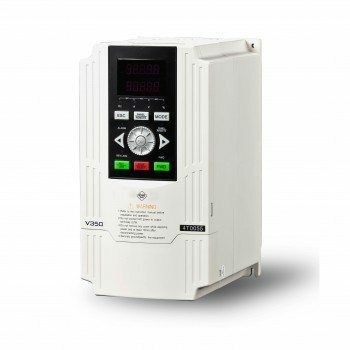 – Vivid real-time monitoring, allowing for monitoring input and output current, voltage and so on in real time. – 4-channel multifunctional input terminal, with 29 kinds of terminal function definitions, 16 kinds of programmable status outputs, hence enabling flexible control over parameters. – Having a built-in counter, able to conduct simple counting with match of functional terminals. – Internally integrated and optimized PID controller, facilitating users to conduct closed-loop control over temperature, etc. Able to simplify control system structure, so as to reduce cost. 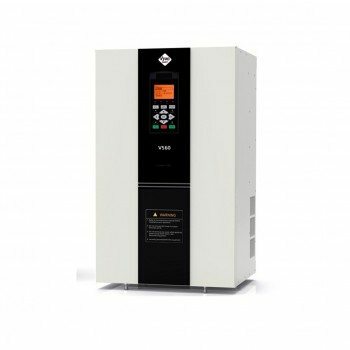 ABOUT VECTOR V350 series is a kind of high-performance lower-power closed-loop vector inverter which is designed based on completely new software and hardware platform and for the purpose of meeting market demands in a better way in the industry of machine tools, winding equipments, multipoint drive equipments, printing, chemical fiber, textile equipments and so on. It features outstanding performance, concise structure, complete protection functions, flexible and rich peripheral interfaces and functions. It can be either applied in all industries or subject to secondary development according to field conditions. – Four control modes: vector closed-loop control with PG (VC), vector open-loop control without PG card (SVC), V/F control and torque control. – High torque at low frequency. Closed-loop vector, up to 200% start torque at zero speed; open-loop vector, up to 180% start torque at zero speed. – Standard 5-digit two-line LED panel display, and optional LCD, HMI operation panel. – Able to rapidly trace speed change caused by sudden change of load. – The high frequency can be up to 1000HZ through use of system macro. – Diverse built-in system macros and application macros. – Hundreds of combinations of torque and revolution. – Programmable 15-stage speed running, with each stage of running time, acceleration and deceleration time and running direction to be separately adjusted. – Flexible configuration of priorities of frequency/revolution setup channels. – Abundant expansion card revolutions: IO expansion card, communication card and PG card. – Built-in brake units with different specifications; allowing for direction connection of brake resistance for rapid stop. 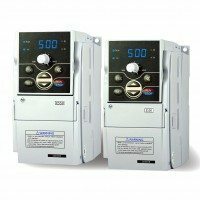 – Automatic voltage adjustment: when the power grid voltage changes, it can automatically keep output voltage constant. – Maximum 75us current closed0loop response cycle, 200% start torque at zero speed. – Standard 5-digit two-line LED panel display, and optional LCD operation panel. – Built-in various system macros and application macros, allowing for simplifying parameter setting through use of macro parameters. – Use of virtual input and output interfaces to minimize external wiring and interface caused by external wiring. – Automatic self-balancing of current, power or torque in the case of multiple motor linkage. – Spindle servo and division positioning control. – Any unsaved parameter adjusted at field can be saved, abandoned or restored to default value with one key. – Ergonomic operation panel enables locking and unlocking of keyboard or software. – Automatic screening parameters which do not use functional modules or selectively displaying modified, saved or changed parameters. ABOUT LIFT ONE A510/F series frequency inverters are high-end inverter products launched in 2011 on the basis of a new generation of hardware platform for participating in global competition. With original hardware and software platform module design, the whole series products are equipment with built-in DC electric reactors. This series of inverters can at maximum set with six various kinds of peripheral expansion modules. By making combination of various system macros and application macros in the software, these modules can greatly simplify user’s system design scheme about the inverter, and promote automatic control level and control frequency of the entire transmission system.Differences between A510F and A310:The entire series of A510F inverters are equipped with built-in three-phase input filters and DC reactors, while A510 series only have built-in DC reactors. – Closed-loop current vector, open-loop current vector, torque control, V/F control, and adaptive to AC asynchronous motors or permanent magnet synchronous motors. – Loading capacity 120%, long term; 160%–60s; 200%–1s. – Super strong start torque, maximum 75us current closed-loop control cycle, and zero-speed 250% start torque. – Maximum 3000.0Hz base frequency output in high-frequency operation mode. – A single unit can be simultaneously connected with 2-3 bus communication modules (MODBUS/PROFIBUS-DP/…). – Exclusive communication linkage control function, allowing for automatic self-balancing of current, power or torque during synchronous transmission of multiple motors and synchronous linkage of position. Elektropohony. – Standard configuration of two kinds of double groups of motor parameters (asynchronous motors, synchronous motors), allowing for switching of vector control of two sets of motors of different capacity or different kinds. – Virtual input and output functions. Kompletné elektropohony VYBO Electric .